The SHS Alumni Association was formed in 2005 after Julia Allen McCullers (Class of 1951) and Ann Lee Huckenbeck (Class of 1954) met with Ann Williams, Associate Superintendent for Facility Services for the Johnston County Board of Education, to discuss what the school board planned to do with old Smithfield High School building on South Third Street. Julia and Ann were elated when they learned that the old building (a portion dating back to 1913) was going to be thoroughly renovated for school system offices. They were even more pleased when Ms. Williams agreed that a room in the renovated building could be set aside for the storage and display of SHS memorabilia. Realizing that an organized group would be needed to locate any school artifacts that still existed, the two women formed the SHS Alumni Association – made up of local graduates from the 1940s, 1950s, and 1960s. This group met often for the next 2 1/2 years to collect, organize, and display the remnants of SHS history that former students donated. In December 2007 the Alumni Association formally requested that the Johnston County Board of Education name the former SHS building for A.G. Glenn, the devoted principal of Smithfield schools from 1933 until 1965. In April 2008 the school board granted the association's request, and later that month the beautifully renovated A.G. Glenn Buildiing was dedicated with pomp and circumstance attended by hundreds of SHS alumni. Since then, the SHS History Room as well as hallways on two floors have been filled with memorabilia and many historical photographs that may be viewed by the public, without appointment, from 8 a.m. to 4 p.m. Monday through Friday. In addition, arrangements have been made to open the building at agreed-upon times on weekends to accommodate SHS alumni attending their class reunions. built in 1913 and housed Smithfield High School until 1922, when the high school moved to the third floor of a newly constructed building on Rose Street (the enlarged campus also housed Smithfield Elementary School). 1949 a large addition to the 1913 structure doubled its size (including a new lunchroom in the basement and a large library on the top floor). 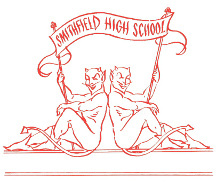 That facility served as the home of SHS until 1969, when the school gave way to consolidated Smithfield-Selma Senior High School. Meanwhile, the old SHS building continued in service as the home of Smithfield Junior High until 1976, when a new facility opened on Booker Dairy Road (today's Smithfield Middle School). That same year the Rose Street building, which contained the auditorium for Smithfield schools, was heavily damaged by fire and subsequently demolished. In the years that followed, the old Third Street building for a while housed the county's Academically and Intellectually Gifted Center but had been vacant for some time when the renovation project began in 2006.